At Chewy, we realize how meaningful your four-legged best friend is to you, therefore we only carry the best in dog supplies, including dog food, dog treats and dog toys. If you've been searching for sliced dog food, look no further. 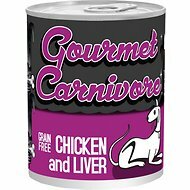 Among the wide selection we carry, one option to try is Tiki Dog Gourmet Carnivore Chicken and Liver Grain-Free Canned Dog Food. Key benefit: great for all life stages, helps dogs consume more moisture and mimics a biologically appropriate diet. Another product is Tiki Dog Gourmet Carnivore Beef, Liver and Lamb Grain-Free Canned Dog Food. Key benefit: great for all life stages, helps dogs consume more moisture and mimics a biologically appropriate diet. Whatever it is you're looking for, Chewy has got you covered. Shop our wide selection of dog supplies today and treat your furry friend to a box of new goodies. For all your pet needs including sliced dog food, Chewy has you covered! We're here for you.